You may have noticed that I have been absent for the past three days. Frankly, I just completely wore myself out. Between moving my mom, moving my antique booth, spending all Saturday morning in the ER with my sister after she fell, and preparing for a big family weekend I depleted all of my reserves. So I decided that I would just kick back a bit and spend time enjoying my family. 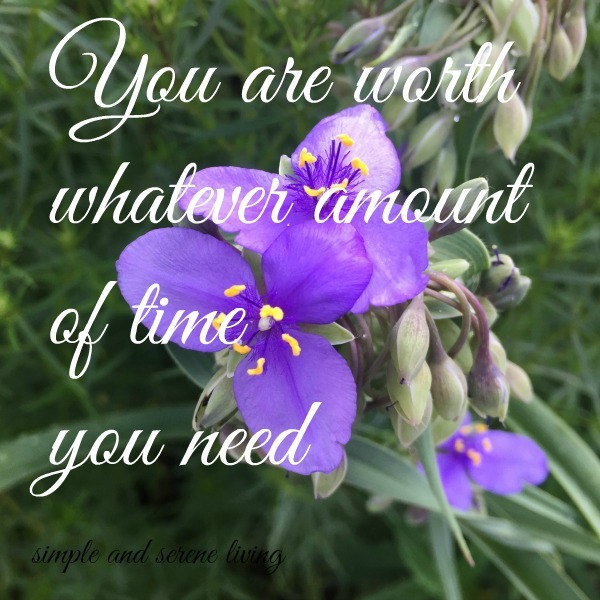 Sometimes with all of the responsibilities of life we forget to just take time for ourselves, and it is important to remember that no matter how much time we may need for ourselves we are worth that time. I know that I am going to be more vigilant about taking time to care for "me". I am just going to say no when I am unable to do something, and I am going to try and remember that I am no longer 20 years old. So take time for yourself this week. You are definitely worth it. P.S. There is more Monday inspiration here. I agree, it's so important to take time for yourself. You can't be of service to others if you don't take care of yourself first and foremost. good for you, and hope your sister will be okay. Laura, I hope that everything is back to a good normal now. That's a lot to be happening to anyone, and it can wear you down. Good for you to take some time, refresh yourself, and of course look after yourself. Take more time if you need---we have to make ourselves come first. Just as they advise on planes---use your oxygen first before you try to help others. Laura, I find with so much on my plate and now that I'm older I have to take me time or I fall apart and that doesn't help anyone! I so understand. For many years I helped my Mom with my aging Daddy while working outside the home and doing all the things that women do to keep everything together. It is exhausting. I commend you for taking some time for yourself and hope that not a minute of that time was spent feeling guilty. You deserve it and I do hope you stick with your decision to take things a bit easier. Take care of yourself dear friend. You are important to many of us. So difficult for me to find time for myself right now with the renovation going on, but today, as I was supposed to paint... I just collapsed on my bed and woke up two hours later... Somehow, it was some "me" time!